Focal Press has published Documentary Editing: Principles and Practice. 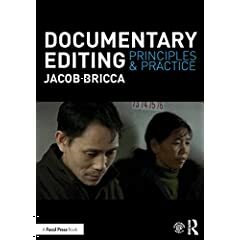 This book offers clear and detailed strategies for tackling every stage of the documentary editing process, from organizing raw footage and building select reels to fine cutting and final export. Written by a Sundance award- winning documentary editor with a dozen features to his credit and containing examples from over 100 films, this book presents a step-by-step guide for how to turn seemingly shapeless footage into focused scenes, and how to craft a structure for a documentary of any length. The book contains insights and examples from seven of America’s top documentary editors, including Geoffrey Richman (The Cove, Sicko), Kate Amend (The Keepers, Into the Arms of Strangers), and Mary Lampson (Harlan County U.S.A.), and a companion website contains easy-to-follow video tutorials. Written for both practitioners and enthusiasts, Documentary Editing offers unique and invaluable insights into the documentary editing process.